The Wells Fargo Tower is at the highest point of Bunker Hill in Downtown Los Angeles. It stands next to its sister building the KPMG Tower and is a prime location at the heart of the city. This award winning building contains a three-story, glass-enclosed atrium linking the two towers and showcases one of the most significant sculpture collections in Southern California, as well as an extensive array of restaurants and specialty shops. Featuring beautifully appointed reception area, conference rooms and individual offices with view of the whole city from the 25th floor. 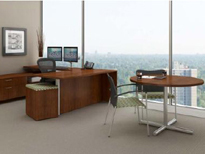 Other executive suites include the US Bank Tower and the US Gas Tower, 2 of the tallest buildings west of Chicago.